Watch out! These faux shagreen accents are a bedroom must-have. 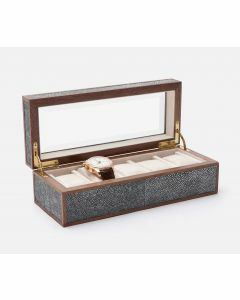 Pigeon & Poodle's most popular material covers the Elmbridge; a wood veneer border, poly-suede interior, and beveled glass lid are just a few of our brand-new watch box’s thoughtful details. 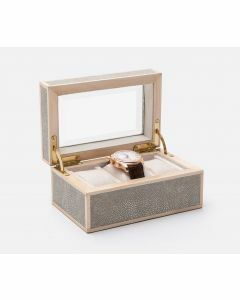 This fabulous box hold three watches and measures 7"L x 4.5"W x 3.5"H. Click on images for greater detail. **Please note that there is a 25% restocking fee to return this item, plus the cost of return shipping.